“The ECB is failing to deliver on its inflation target not because it has run out of instruments but because it has based its policy on a poorly performing economic model. The ECB never expects inflation to deviate from the target of just under 2 per cent. Yet each month inflation undershoots, and the ECB is apparently taken by surprise.” (Münchau 2014). It so happens that the model referred to, based on Smets and Wouters (2003), was built on the basis of Woodford’s analysis and fitted to pre-crisis European data. It worked well during the Great Moderation; but, as it had no financial sector, it failed completely to predict or rationalise the ensuing crisis. In such models, the economy is inherently stable and, if left alone, will head for high output and target inflation. Could it be that the ECB, charged with managing the newly created euro, believed that it had found the philosopher’s stone – a technically sophisticated model built in line with the latest academic principles that would serve it in good times and in bad? If so, it could be making a mistake about the nature of economics. As Gilboa et al. (2014) warn in their recent paper, economic models are not in general designed to incorporate universal laws of behaviour. They are often more like elaborate ‘case studies’ fitted to particular circumstances – to be employed with care elsewhere. Thus, as in Table 1 below, the choice of model and policy should be adjusted as best suits the regime. During the Great Moderation, for example, the ECB-style model with a Taylor rule could be appropriate, as shown in the top left; but this should be suspended during the Great Recession, in favour of QE, followed by forward guidance to exit, as shown in the bottom right. Maybe there´s a “universal law” and that´s: “spending makes the world go around”. It was not because there was no financial sector in the model that made it “fail completely to predict or rationalize the ensuing crisis”. It was the colossal failure of monetary policy that brought the crisis about, just as it is the monetary timidity that is making the recovery so insipid and stretched. Before anti-inflationism became a moral crusade, it was possible for people like Richard Nixon and Ronald Reagan, who were disposed to favor low inflation, to accommodate themselves fairly easily to an annual rate of inflation of 4 percent. Indeed, it was largely because of pressure from Democrats to fight inflation by wage and price controls that Nixon did the unthinkable and imposed wage and price controls on August 15, 1971. Reagan, who had no interest in repeating that colossal blunder, instead fought against Paul Volcker’s desire to bring inflation down below 4 percent for most of his two terms. Of course, one doesn’t know to what extent the current moral and ideological crusade against inflation would survive an accession to power by a Republican administration. It is always easier to proclaim one’s ideological principles when one doesn’t have any responsibility to implement them. But given the ideological current ideological commitment to anti-inflationism, there was never any chance for a pragmatic accommodation that might have used increased inflation as a means of alleviating economic distress. Let´s see how “spending” has shaped the “world” (in this case the US economy over different “Great” epochs). I´ll start with the epoch that came to be called “Great Inflation”. What caused it? 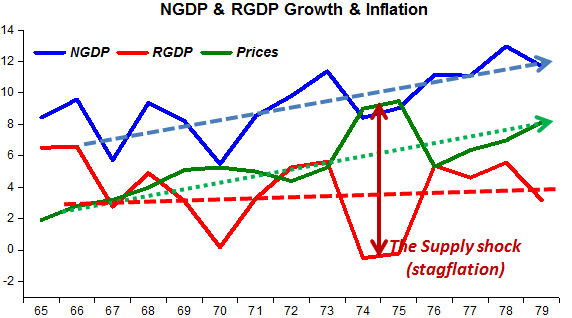 The chart clearly illustrates that the growing trend in spending (NGDP) was followed by a upward trending inflation (sometimes obscured by price controls, sometimes enhanced by oil (supply) shocks). The next charts illustrate the “Great Moderation” epoch and the “Great Recession”. Back in the day, I think it was Orphanides who coined the expression “opportunistic disinflation” to describe the fall in spending growth that brought inflation to the desired 2% trend. For the whole period, spending growth is quite stable and on the occasions it falters, real output and inflation “react”. The “Great Recession” is the direct result of a monetary policy blunder that allowed spending to contract! Everyone suffers. Firms don´t sell so they don´t produce and don´t hire (and dismiss “excess labor”). Debtors’ don´t pay and banks (financial system) go “broke”. The Fed comes in throwing liquidity around to rescue the financial system because (as Bernanke knew from his academic work) they have an enormous capacity to propagate the monetary shock. QE1 marks the spending turnaround but it lacks “conviction”, maybe being constrained by the “moral crusade” discussed by Glasner. So the economy “limps” along. But we know that “limping” has side-effects on the “economic body”! 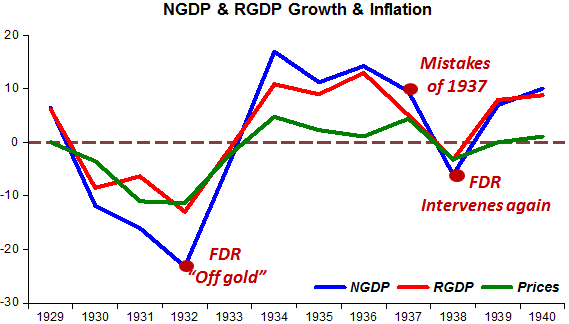 Now, look at the monetary “punch” applied by FDR during the “Great Depression; and how he intervenes again when monetary policy (spending) goes “off-track” in 1937. It seems that in “sickness and in health” it is the behavior of spending (determined by monetary policy) that “calls the shots”. The economy is really inherently stable, not by being left alone but by being guided by the appropriate monetary policy, in particular a policy that keeps spending growing adequately. I’m glad you understood Glasner’s post. I really did not.